A fire that killed a 64-year-old Toms River woman last week started in a garbage can in the basement of the home, the Ocean County Prosecutor’s Office said Tuesday. “The cause of the fire is accidental and improperly discarded smoking material could not be eliminated,” said Al Della Fave, spokesman for the prosecutor’s office. After an autopsy by the Ocean County Medical Examiner, the victim of the Feb. 14 fire was identified as Ellen Tanner, 64, a resident of the home. The manner of death was ruled accidental and the cause of death was smoke inhalation and heat related injuries as a result of the house fire, said Della Fave. Toms River Police spokesman Ralph Stocco said first responders were called at 11:03 a.m. to the home at 1911 Fiddlers Run, near the intersection of routes 70 and 9. Witnesses told the emergency workers that a woman was trapped in the home, Stocco said. Police Officers Scott Fallano and Raymond Beyerle, who were first to arrive, entered the front door and tried to locate the woman, but were quickly turned back by the thick smoke, Stocco said. 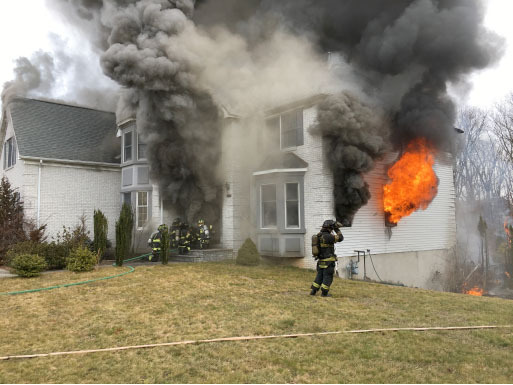 Once outside, they located a 67-year-old male resident in the back yard who had escaped the blaze, but was trying to regain entry to his home to locate the woman. The structure was now fully engulfed in flames and rescue attempts were not successful. The man, who suffered burns to his hands, was removed to a safe distance. The 64-year-old woman, who also resided at that address, did not survive the fire. The man declined medical treatment at the scene, Stocco said. The names of the two victims were not released by police. The cause of the fire is still under investigation by Toms River Detective Roger Hull. Also involved in the investigation are the Ocean County Prosecutors Office Arson Unit, Ocean County Sheriffs CSI, and Toms River Bureau of Fire Prevention. Responding fire units were Pleasant Plains, Silverton, East Dover, Toms River #1 and #2, Island Heights, and Manchester. Medical units responding were Toms River Police EMS, MONOC Paramedics, and Silverton Volunteer EMS.